Having to wear a retainer following orthodontic treatment is almost universal. The aim of this study was to compare the survival time of the Hawley retainer (HR) and the clear overlay retainer (COR) over one-year follow-up and to analyze risk factors contributing to their breakage. 120 adolescent patients were randomised to receive either a HR or COR. Information on breakage dates , reasons for breakage and the broken parts of the retainers were recorded. A survival analysis was used to describe retainer survival over time. No significant difference in the survival times between the two groups for mandibular or maxillary retainers. While both retainers tended to fracture the locations of the fractures was different. …our analysis suggests that the survival times of the HRs and CORs were not statistically significantly different. 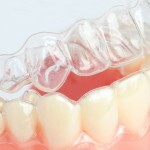 Therefore, clinicians could advise their patients to wear either of the two retainers without taking breakage into consideration. Sun J, Yu YC, Liu MY, Chen L, Li HW, Zhang L, Zhou Y, Ao D, Tao R, Lai WL. Survival time comparison between Hawley and clear overlay retainers: a randomized trial. J Dent Res. 2011 Oct;90(10):1197-201. Epub 2011 Jul 19. PubMed PMID: 21771797.